Have been doing the math and craving a complete setup of Atari's final console? Still want to see what those 64-bits were all about, and need a shiny new vintage NTSC console? Well, chances are you'll be most interested in this boxed Atari Jaguar & Jaguar CD eBay auction for the NTSC systems then. Everything seems to be in great condition and complete in its box. 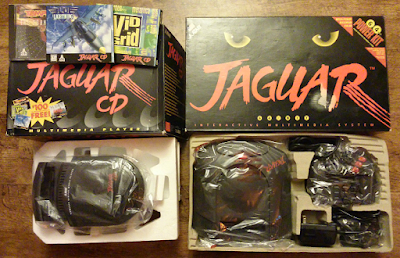 Consoles aside, you'll also be bidding on power units, manuals, required bits and pieces, a multitap adapter, the Jaguar CD pack-in titles (Blue Lightning, VidGrid and the Tempest OST), and 10 boxed games including the excellent Wolfenstein 3D, Raiden, Tempest 2000, Flashback and Pitfall. Oh, and the CD unit is essentially unused too.